Good Monday morning! We've finally had a break from the heat wave today here in NY and it's the first morning I didn't have to turn the AC on. We're getting some badly needed light rain and my potted plants are smiling! For the most part, I try to use products in my projects that are current to the Stampin' Up catalog so that you can recreate my project if you like. But once in a while I pull out a retired product or two, and when I do that I feel like it gives me license to pull out all sorts of retired goodies! 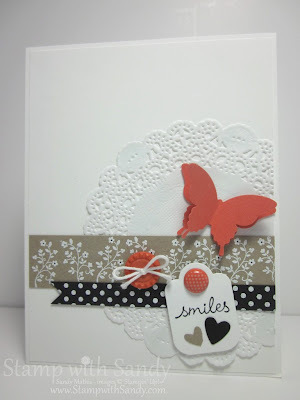 I'd pinned a card on one of my Pinterest boards a while back that I wanted to re-create using Stampin' Up products, and the sketch this week by Jaydee at The Paper Players was the perfect opportunity to do so. My first inclination when I saw the colors at Dynamic Duos this week was to make a Halloween card, but I resisted! 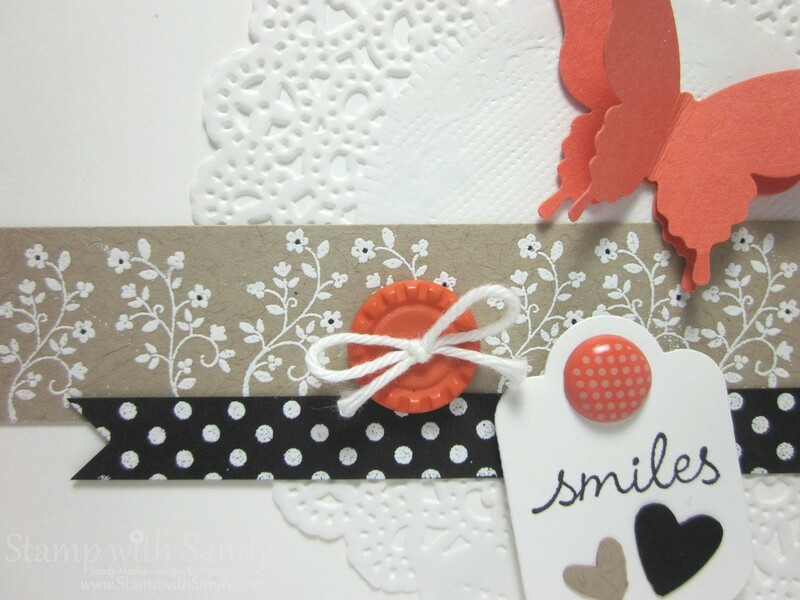 Instead I made a card that had lots of white space with just a touch of Calypso Coral and Basic Black. I even added the desert option of butterflies! I couldn't find any DSP's that would work for my re-creation so I created my own using card stock, Versamark Ink and White Embossing Powder. The "smiles" greeting was from one of the stamps from the Petite Pairs Stamp Set. I used a Basic Black marker to omit some of the sentiment. I LOVE your card, the colors, and the layout! I like it when "my bloggers" use retired products...after all don't we ALL have some! OH. MY. GOSH! You are hitting them out of the park, my friend! This is so lovely! SQUEAAAAL! I ran away from that color challenge because I couldn't get Halloween out of my head, but this is one of the prettiest I've seen! PIN-worthy for sure! Darling card, Sandy! OMG, love all the white space so perfect for the CAS challenge. You've used the perfect balance of these two colors so it says "elegant" not "halloween"! Love how you made your own dsp--especially with the teeny black dots! Perfect! So glad you joined us this week! 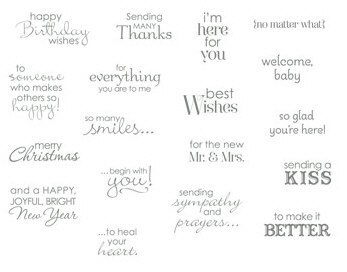 I LOVE YOUR CARD!! So many lovely ideas....the white embossing, the layout, but I think my favourite detail is the use of the Hearts a Flutter die as a sentiment tag!!!! Genius! This one is right up my alley, Sandy! I like how you've designed your card using the sketch! You've perfectly used the DD colors, neutrals, and all that yummy white space!! Sandy your card is so beautiful, I love the white doily on the white background and your printed brad. 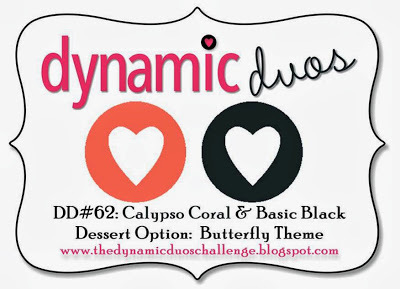 Thank you so much for sharing your card wit us this week at Dynamic Duos! So glad you joined us at Dynamic Duos this week Sandy, your card is gorgeous!